First Use of The "Bible Belt"
When American geographers map rates of religious belief and regular attendance at places of worship, a distinct region of religiosity appears on the map of the United States. This region is known as "The Bible Belt" and while it can be measured in a variety of ways, it tends to include much of the American South. The term Bible Belt was first used by the American writer and satirist H.L. Mencken in 1925 when he was reporting on the Scopes Monkey Trial which took place in Dayton, Tennessee. Mencken was writing for the Baltimore Sun and referred to the region as the Bible Belt. Mencken used the term in a derogatory way, referring to the region in subsequent pieces with such quotes as "the Bible and Hookworm Belt" and "Jackson, Mississippi in the heart of the Bible and Lynching Belt." The term gained popularity and began to be used to name the region of the southern U.S. states in the popular media and in academia. In 1948, the Saturday Evening Post named Oklahoma City the capital of the Bible Belt. In 1961, geographer Wilbur Zelinsky, a student of Carl Sauer, defined the region of the Bible Belt as one in which Southern Baptists, Methodists, and evangelical Christians were the predominant religious group. Thus, Zelinsky defined the Bible Belt as a region stretching from West Virginia and southern Virginia to southern Missouri in the north to Texas and northern Florida in the south. The region that Zelinsky outlined did not include Southern Louisiana due to its preponderance of Catholics, nor central and southern Florida due to its diverse demographics, nor South Texas with its large Hispanic (and thus Catholic or Protestant) population. The region known as the Bible Belt today was in the seventeenth and eighteenth centuries a center of Anglican (or Episcopalian) beliefs. In the late eighteenth century and into the nineteenth century, Baptist denominations, especially Southern Baptist, began to gain in popularity to the point in the twentieth century when evangelical Protestantism could be the defining belief system in the region known as the Bible Belt. In 1978 geographer Stephen Tweedie of Oklahoma State University published the definitive article about the Bible Belt, "Viewing The Bible Belt," in the Journal of Popular Culture. In that article, Tweedie mapped Sunday television watching habits for five leading evangelical religious television programs. His map of the Bible Belt expanded the region defined by Zelinsky and included a region that encompassed the Dakotas, Nebraska, and Kansas. But his research also broke the Bible Belt into two core regions, a western region and an eastern region. Tweedie's western Bible Belt was focused on a core that extended from Little Rock, Arkansas to Tulsa, Oklahoma. His eastern Bible Belt was focused on a core that included the major population centers of Virginia and North Carolina. Tweedie identified secondary core regions surrounding Dallas and Wichita Falls, Kansas to Lawton, Oklahoma. Tweedie suggested that Oklahoma City was the buckle or capital of the Bible Belt but many other commentators and researchers have suggested other locations. It was H.L. Mencken who first suggested that Jackson, Mississippi was the capital of the Bible Belt. Other suggested capitals or buckles (in addition to the cores identified by Tweedie) include Abilene, Texas; Lynchburg, Virginia; Nashville, Tennessee; Memphis, Tennessee; Springfield, Missouri; and Charlotte, North Carolina. 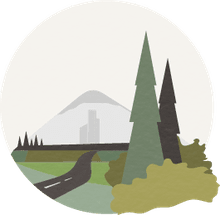 On the other hand, Gallup and others have pointed out that the opposite of the Bible Belt, perhaps an Unchurched Belt or a Secular Belt, exists in the Pacific Northwest and the northeastern United States. Gallup's survey found that a mere 23% of Vermont residents are considered to be "very religious." The eleven states (due to the tie for 10th place) that are home for the least religious Americans are Vermont, New Hampshire, Maine, Massachusetts, Alaska, Oregon, Nevada, Washington, Connecticut, New York, and Rhode Island. Many commentators have pointed out that while religious observance in the Bible Belt is high, it is a region of a variety of social issues. 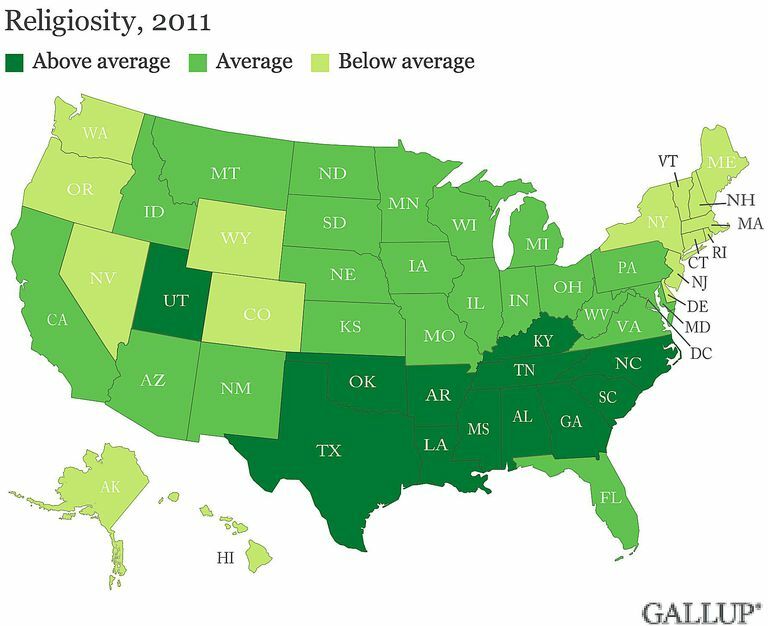 Educational attainment and college graduation rates in the Bible Belt are among the lowest in the United States. Cardiovascular and heart disease, obesity, homicide, teenage pregnancy, and sexually transmitted infections are among the highest rates in the nation. At the same time, the region is known for its conservative values and the region is often considered to be a politically conservative region. The "red states" within the Bible Belt traditionally support Republican candidates for state and federal office. Alabama, Mississippi, Kansas, Oklahoma, South Carolina, and Texas have consistently pledged their electoral college votes to the Republican candidate for president in each presidential election since 1980. Other Bible Belt states usually vote Republican but candidates such as Bill Clinton from Arkansas have sometimes swayed the votes in Bible Belt states. In 2010, Matthew Zook and Mark Graham utilized online place name data to identify the preponderance of the word "church" locally. What resulted is a map that is a good approximation of the Bible Belt as defined by Tweedie and extending into the Dakotas. Other Bible Belt-style regions have been named in the United States. The Rust Belt of the former industrial heartland of America is one such region. Wikipedia provides an extensive list of such belts, which include the Corn Belt, Snow Belt, and Sunbelt.